Creatine, coffee, calories and cardio. Recent research suggests the observation that chronic obstructive pulmonary disease (COPD) patients are often malnourished and have less exercise capacity . Furthermore, patients with low body mass index (BMI) should be considered at a greater risk of mortality. 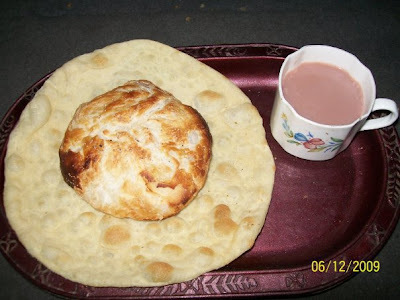 It is not clear whether poor lung function is a cause of poor nutritional status or if poor nutritional status precipitates a decline in lung function results. An observation study constituting 1 patient who thinks he suffers from COPD and is definitely malnourished.The patient is aged between 25-30 years. Figure 1 shows his calorie intake for one day. 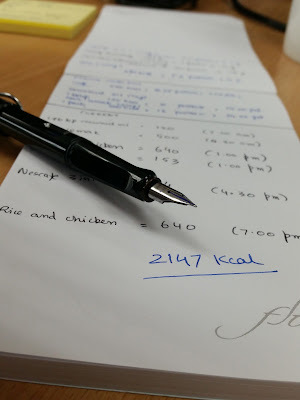 patient is supposed to add another meal and some snacks to his daily schedule to hit 3000 Kcal daily. Patient is also mixing few grams of creatine to his daily morning coffee to help him be energetic enough to go to the gym and workout. Patient has increased his water intake by an amount that fits his new water bottle. Creatine intake has helped to be more motivated and less brain-dead for gym activity. The amount of time spent in the toilet has increased. Weight seems to be increasing as well, but a longer study of weight gain is advised. The time spent in cardio exercise is increasing. It is getting harder to wake up in the morning, and assistance from shouting spouse is needed more frequent than earlier. The increased gym activity and cardio exercise seems to be helping with the breathing. Since lung function wasn't tested quantitatively in this study, therefore, a quantitative study is advised. Qualitatively, the patient thinks he is making progress and felt the need to blog about it. Ezzell, Lisa and Jensen Gordon. Malnutrition in chronic obstructive pulmonary disease, Am J Clin Nutr;72(6):1415-1416.